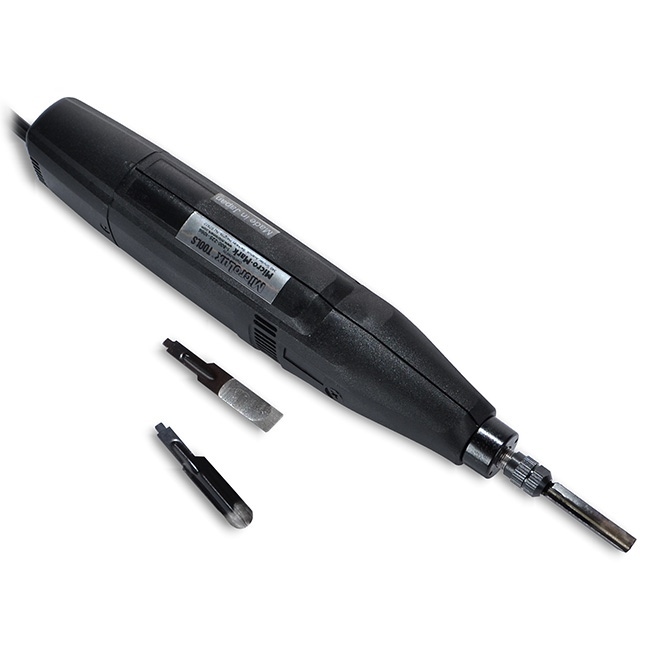 MicroLux® Powered Chisel Cuts Like a Hot Knife Through Butter! Carve hardwood, softwood, vinyl, soft plastic, foam-board, rubber, wax and more! Hammer-like reciprocating action activates automatically, providing incredible cutting power. Complete projects in a fraction of the time! Includes 3 blades: 9 mm #1 flat chisel, 6.4 mm 90 degree V parting chisel and 9 mm #9 sweep gouge, plus collet wrench. 110V; 50/50 Duty Cycle. High quality, Made in Japan. Includes 3 blades: 9 mm #1 flat chisel, 6.4 mm 90 degree V parting chisel and 9 mm #9 sweep gouge, plus collet wrench. 110V; 50/50 Duty Cycle. High quality, Made in Japan.